The Woombie was designed by a RN & Certified Infant Care Specialist, providing the safest and most comfortable swaddle for your baby. Gently hugging the shoulders & tummy, the Woombie allows for natural movement of the arms, legs and hips with our signature bebeflex® fabric- softly cocooning baby without restricting mobility or development. Its soft eco-fabric mimics the feeling of touch, warmth & cuddle- re-creating the womb environment baby felt prior to birth which is important for calming baby and preventing flailing arms. The Woombie has been shown to promote a more natural and peaceful sleep environment for infants resulting in longer periods of sleep with less restlessness. The Woombie prevents issues such as startling, face scratching, overheating and dangerous loose unraveled blankets from covering baby’s face. Infant Care Experts recommend the Woombie products to institute successful sleep patterns from birth to 6 months. 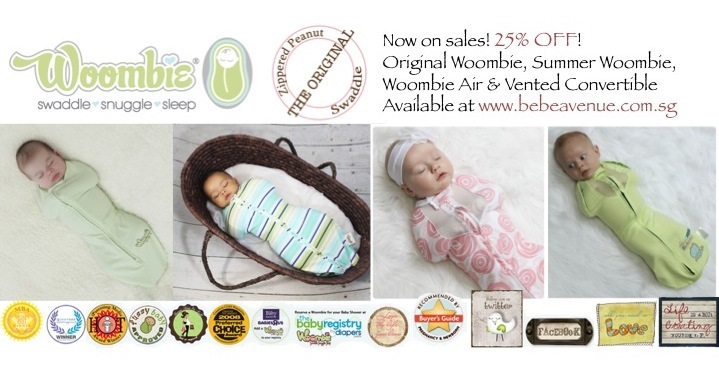 25% OFF on all Woombie Swaddler at www.bebeavenue.com.sg till 30 June 2013.